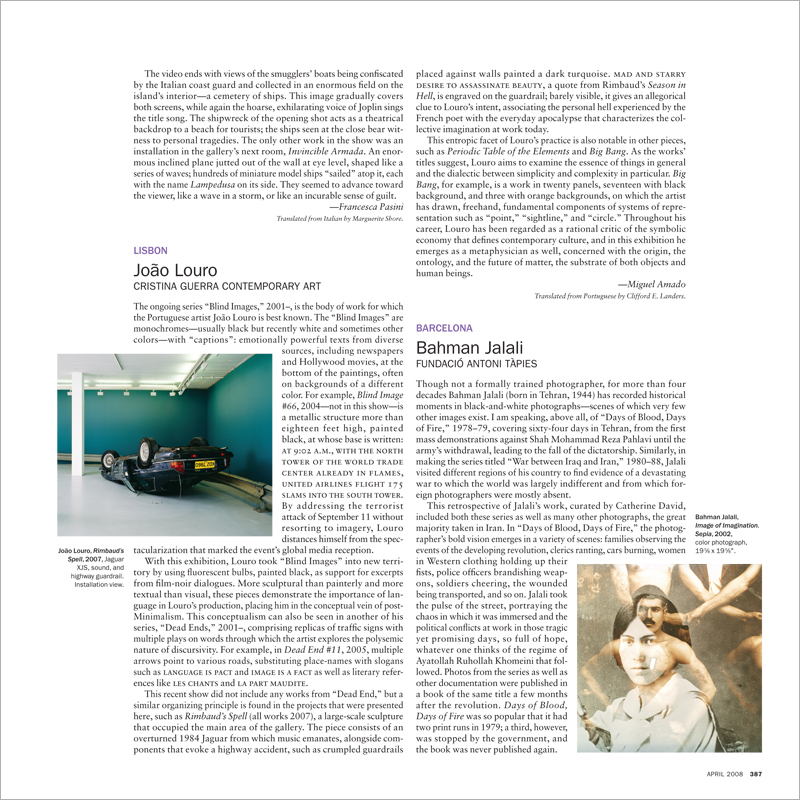 The ongoing series “Blind Images,” 2001–, is the body of work for which the Portuguese artist João Louro is best known. The “Blind Images” are monochromes—usually black but recently white and sometimes other colors—with “captions”: emotionally powerful texts from diverse sources, including newspapers and Hollywood movies, at the bottom of the paintings, often on backgrounds of a different color. For example, Blind Image #66, 2004—not in this show—is a metallic structure more than eighteen feet high, painted black, at whose base is written: AT 9:02 A.M., WITH THE NORTH TOWER OF THE WORLD TRADE CENTER ALREADY IN FLAMES, UNITED AIRLINES FLIGHT 175 SLAMS INTO THE SOUTH TOWER. By addressing the terrorist attack of September 11 without resorting to imagery, Louro distances himself from the spectacularization that marked the event’s global media reception.